Discussion trying to post but have been blocked ? trying to post but have been blocked ? hi, i'm trying to posta question but got blocked when quoting some configs ? it's a bit hard to explain what the problem is without being able to quote code ? I upgraded to 2.8 and am getting Nginx 404 errors when trying to post. I'm trying to figure out following your new updated docs but can't seem to make it work. I'm hosting this on a Plesk server (root access). Plesk automatically manages nginx config files and i'm having a hard time following your instructions since it won't let me overide the config files and the directives i can add in the Plesk ctrl panel are limited it seems. i'm pretty new to Vanilla but have experience with webdev, i'm new to Nginx however and although everything went ok for the upgrade my users are having issues to post. At first i couldn't replicate the error, i could post without problems as admin and with several test member and moderator accounts but my users kept saying they can't post .. but they could still send messages but not reply to a message. Invalid nginx configuration: nginx: [emerg] duplicate location "/"
because / is already defined in the automatically generated config file. with Apache proxy mode on and it doesn't work, apparently you can only overwrite when proxy is off. With proxy mode of the site runs but the editor is broken (missing icons) and i get post errors on some platforms. so if i remove the location / and switch Apache proxy mode back on it works (at least the editor and no apparent errors so far) but i don't get pretty urls. in config.php i get pretty urls and navigation to all pages and sections works .. but i get 404 nginx errors when i try to post. 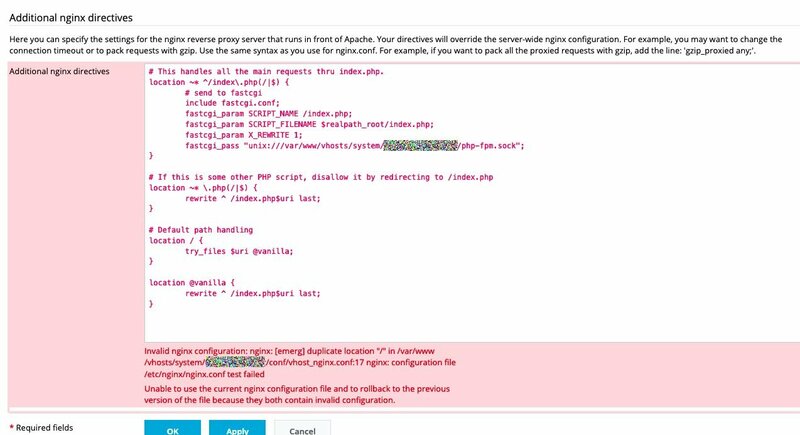 nginx is used as a proxy but Apache seems to be the web server. I never used that constellation, but I wouldn't try to apply the nginx settings here but look for the apache virtual host configuration. Vanilla comes with a htaccess.dist file which should be an example of what to use in Apaches vhost settings. ok thanks, i switched back to pure Apache, i haven't worked with nginx before so need to lear about it more before i try it ..
For me an older version of this digital ocean guide was very helpful. Aside from our use of nginx for our production environments I've had a lot of luck using nginx as a reverse proxy in front of other applications for free automated SSL certificates with LetsEncrypt, handling some automatic top level redirects (between different domains and subdomains) as well as its performant static file serving.